For wedding make-up artist Faye Young, standing by the sidelines of engagement sessions and weddings is all part of a day’s work. Little did she know that starting November 2012 and come 2013, she will no longer be behind the pictures. From “make-up artist“, she will take center stage and become the “bride“. Faye and Jag met through a common friend but the connection started when the two started communicating in Facebook. The first day they spoke turned Faye’s sad birthday into a start of something wonderful. Being of Indian descent, Jag did not know the meaning of panliligaw [courtship]. Faye explained that courtship is when two people go out and get to know each other, write love letters and give gifts. The next day, Jag had with him a “letter“ and said: “I don’t have chocolates & flowers but I’ll get you there when we get there.“ She opened that “letter“ and it was not a letter buta flight ticket to Hongkong! But being a mom had responsibilities, she couldn’t leave her daughters behind. Jag agreed and a date for two became a date for four. From then on they have been travelling with the kids to many different countries such as Singapore, Malaysia, Hongkong, Macau, Korea, Beijing and Japan. They fell in love with their destinations as well as with each other. Jag liked teasing Faye with unexpected proposals he jokingly made in the course of their travels. Of course Faye refused to believe them. There was no ring so she never said “Yes“. Jag admits that the three girls changed his life for the better. So one day, he bought a ring with two little diamond hearts on each side for his love for the two girls; and a diamond center stone for Faye. On November 2012, Jag came home from Australia and presented the best pasalubong [gift] he can ever find, a red box with the engagement ring. The whole family was shocked and happy for the newly engaged couple. 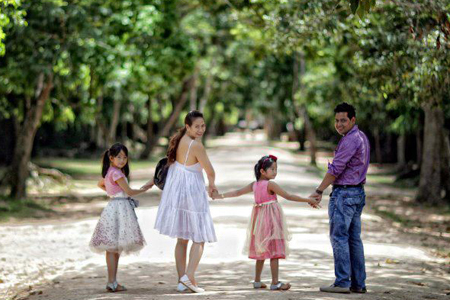 Fellow wedding supplier in the industry, LitoGenilo of Smart Shot Studio took notice of Faye’s travel pictures on Facebook. In love with traveling with his wife as well, they thought of doing a fun prenuptial shoot outside of the country like a barkada [friends] tour. Thanks to promo flights, Faye and Jag were able to have engagement shoots with Lito Genilo and his wife in Singapore, Cambodia and Macau. 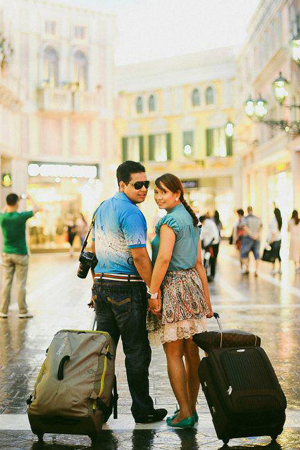 In Macau, Faye and Jag had an engagement shoot with 12 Masters photographer Marvin Dungao and his partner Dindo Panganiban. Book your flights and hotels early. It will save anyone from expensive trips. If you do this it will come out cheaper than going to have it anywhere locally. Research about your destination. Know the visas needed, know the taxes you have to pay too so you don’t get surprised. Plan out the shoot. As it’s going to cost you again to repeat it. Know what shots you like, plan the theme according to your options. For special location shoots, call their ticketing offices ahead for entrance tickets or shoot limitations and secure permits if needed. Agoda hotels help a lot and you can always “google“ your way to anything and anywhere. It’s always good to have Google maps on your phone. Plan your outfits from head to toe and it’s easy if packed separately. Do a color combination for the bride and groom including the hair and makeup. Don’t forget to consider weather conditions in setting outfits. Choose a photographer who is flexible and easy to get along with. Your photographer cannot be a prima donna especially if your on a budget and staying in budget hotels. LitoGenilo of Smart Shot Studio is a fine choice if you want someone talented and can deliver, experienced in international destinations and is fun to be around with. He and his team mates were a blast and made everything more memorable for me and Jag. The photos speak for themselves – a life filled with love, life and travel. For Faye and Jag, this is just the beginning. For inquiries about Smart Shot Studio and their international engagement sessions, go to their Kasal.com profile page.